At age 3, Segun Bailey was taken to the hospital for treatment, rather than getting relief from the doctor’s injection, his dreams were literally punctured by same. Almost moved to tears as he recounts how a doctor’s negligence cost him his legs, Bailey has since picked up what is left of him and he is not weighed down. As a teenager, each time he sees people walk pass, he would think to himself that God was being unfair. He sunk further into his own world when he had to mingle with his peers and rejected any form of pity or special treatment. Deep down there was a burning desire to compete and win. A desire that pushed him towards sports - table tennis. “I started out in sports in wheelchair tennis in 2006. I traveled twice with the tennis team. After that I joined table tennis for a year. Someone then invited me to join basketball and I fell in love with the game. Since then I have been involved in basketball. Having travelled far and wide, Bailey submits that Nigeria is lagging when it comes to catering for people with disability. “When you go to some European countries or even some African countries like South Africa or Algeria, they try to make life easier for people with disability. They provide wheelchairs, they belief walking on crutches is more difficult, which is true. Also there is easy access to buildings. Even though there is the staircase, they also build ramps for wheelchairs", he noted. Despite Nigeria's backwardness in catering for the physically-challenged, Bello reckons that he has done well for himself and his involvement in sport has given an edge over his peers. 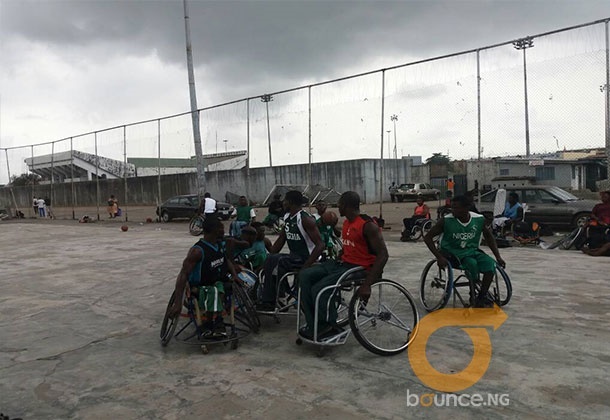 "It makes me feel great to have been able to play wheelchair basketball, to represent Nigeria, to have travelled outside the shores of this country. It is a privilege that very few of my peers from the area I grew up enjoy. I am grateful to God for everything." A common phenomena is to see the physically challenged begging for alms but Bello was emphatic that never crossed his mind. "I was not born to beg. "I thank God for my background and the family I was born into; they did not encourage laziness or being slothful especially my dad. So I never looked down on myself and I determined to be something great in life. "My determination has been an inspiration for those around me and that keeps me motivated. " Asked if he was in a relationship, Bailey said: "I am single not ready for marriage any time soon. For now, I just want to focus all my energies on wheelchair basketball. And while he focuses his energies on the sport he loves, Bailey had a word for the government. "I would love the government to invest in sports generally and para-sports. Not only will it raise our sports profile, it will also be an avenue for job creation." He advised.